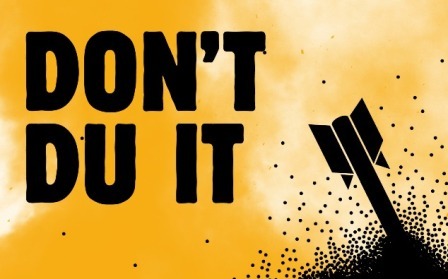 Don’t DU It is CADU’s latest campaign, aiming to get the government to stop using depleted uranium (DU) weapons. Depleted uranium (DU) is a byproduct of the process to enrich uranium for nuclear fuel and weapons. It is very dense and pyrophoric, which means fine particles of DU burn at low temperatures. Its density made it attractive to the military as an anti-armour weapon. 6,994kg of DU has been fired in the Balkans (by the US) and 404,000kg in Iraq (by the US and UK). DU is chemically toxic and radioactive, and the fine dust produced when it is fired at hard targets is a hazard if inhaled, with the potential to cause cancers and birth defects. The remains of contaminated vehicles are often not disposed of carefully after conflicts, leaving civilians at risk of exposure. Countries recovering from conflict often lack the capacity to both clean up toxic remnants of war and monitor the health of their populations, leaving civilians at risk long after the fighting has ended. DU weapons were developed during the Cold War with the threat of a Soviet tank invasion across Europe as a major justification. Even during their development the MoD, after recognising the political unacceptability of the weapons, downplayed the dangers that accompany the use of DU. Even though the world and the nature of conflict has changed, the MoD has not changed its line – continuing to argue that the needs of the military outweigh the protection of civilians and the environment. The UK’s only DU round is called CHARM 3. It comes in two pieces – the uranium dart and a separate propellant charge, and it is this charge that is expiring in 2013. The government want to extend the life of these munitions by either re-licensing or renewing the charges. We are calling on the government to not follow this path and instead see this as an opportunity to remove all DU from their arsenal and take a lead on calling for an international treaty banning uranium weapons. It’s time to ditch DU weapons.